A 1980’s Japanese classic? Is there such a thing I hear you ask? When this model left the showrooms, readers of a certain age group may recollect the anti-corrosion warranty was more of a hope than a promise, thus their poor survival rate should be expected but I harboured a certain admiration for this luxury saloon. The first of the UK Laurel range arrived in 1972, its model code C130 replacing the old 1800 from the 1960s; initially featuring a four cylinder before expanding to six in 1975, although not increasing the 2.0 litre capacity. The C230 first hit our shores in 1977 and carried much of the previous model but the six cylinder 2.4 that had enjoyed much adulation in the 240Z was modified to suit this large saloon. When the C31 version began to retail in 1981 the brand and the Laurel were quite established, renowned for reliability and like most Japanese cars of the era came fully equipped. Its SOHC power plant with single carb could produce 118bhp, propelling its 1.3 tons to sixty in twelve seconds with 109mph top speed. 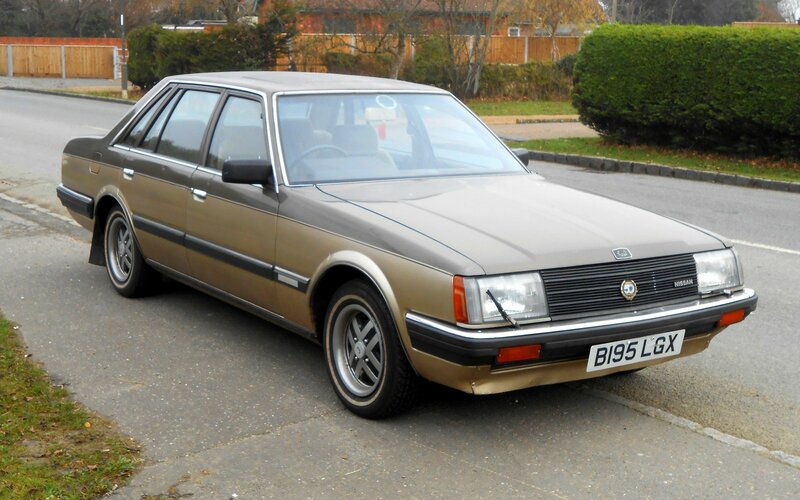 Electric windows, mirrors, sunroof with central locking, PAS, headlight wash-wipe plus radio and separate cassette unit and sofa-like seating meant the Laurel was a nice environment to spend hours on the move; ask any minicab pilot of the time. Home grown machines like the Sierra and the Montego also enjoyed corrosion issues but playing ‘top trumps’ against the machines from the east they couldn’t compete on reliability or equipment. The particular Laurel here is a manual from 1984, a 50th anniversary edition, no doubt with even more toys and proclaims ‘Nissan’ on the grill but Datsun on the boot lid. The company’s decision to unify their products under one logo is estimated to have cost $500 million in advertising and dealer signage; not small change in 1984. This 2.4 is one of six UK cars remaining according to the DVLA and when the final UK version arrived in 1985, the C32 was more of a facelift than a redesign. The Laurel was never the most memorable machine but I think it has earnt its chance to feature as a classic, although I maybe in the minority here; agree or not dear reader, your thoughts are most welcome. In 1936, two friends Charles Deutsch and Rene Bonnet set up the D-B company, initially building specials with Citroen running gear but switched to Panhard with post war Formula 3 racing the target in 1949. D-B sports cars featured highly tuned, twin cylinder Panhard power, air cooled, fast and also light with re enforced polyester body panels they enjoyed class wins at Le Mans, Sebring and the Mille Miglia. In 1961, Bonnet wanted to utilise Renault power whilst Deutsch insisted they remain with Panhard and the partnership dissolved; both would continue with their own projects. Automobiles Rene Bonnet employed designer Jacques Hubert and together they produced the first Djet, a small coupe with the Renault 8 engine turned 180 degrees for an in-line mid-engine configuration. Steel chassis with fibre glass panels were produced by Matra engineering; out-sourced by Bonnet to allow for more factory production space. The 1108cc Renault unit was used in the first Djet and a Gordini tuned version was also available, the race version took a class win at Le Mans in 1963. The following year Bonnet ran into financial problems, so Matra cleared the debts and continued with the model from 1964. Bonnet versions totalled around 200 and have become prized collector cars whilst Matra would bring production numbers up dramatically until 1968; totalling 1,493. Phillipe Guedon was brought in from Simca and made 90 modifications for the 1965 model Djet 5 with a power increase to 94bhp in the Gordini version. One ‘5’ coupe was presented to Yuri Gagarin by the French Government in recognition of his achievements. It is said that the Russian astronaut felt slightly uncomfortable driving the stylish sports car in his home country and after his death it was sold to a Lithuanian collector who keeps its location secret after several theft attempts. The final versions were shown at the 1966 Paris show where the range topper enjoyed a Gordini 1255cc unit with 105bhp; its name had lost its ‘D’ but the ‘Jet’ survived. 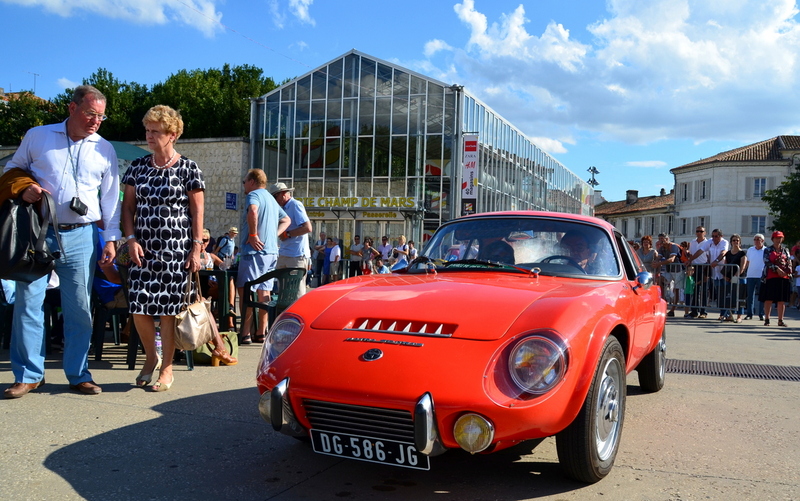 Surely, if any reader has spent time within one of these rare Gallic sportsters they will have a tale or two to share.